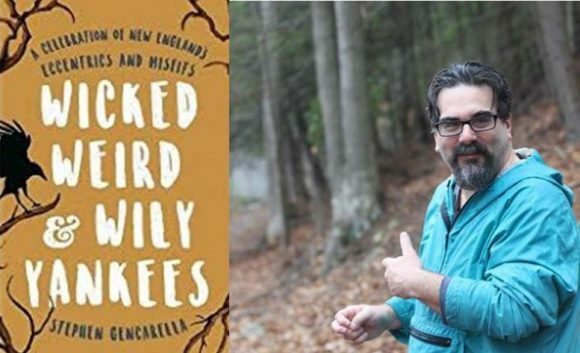 ESSEX — On Tuesday, June 19, at 5:30 pm, join Stephen Gencarella as he shares some of his fantastic stories of the prophets, vagabonds, fortune-tellers, hermits, lords, and poets who shaped New England. New England has been a lot of things–an economic hub, a cultural center, a sports mecca–but it is also home to many of the strangest individuals in America. Wicked, Weird, & Wily Yankees explores and celebrates the eccentric personalities who have left their mark in a way no other book has before. Some folks are known and others not so much, but the motley cast of characters that emerges from the pages of his book represents a fascinating cross-section of New England’s most peculiar denizens. Listen as Steve tells the tales of the Leather Man and the Old Darned Man, who both spent years crisscrossing the highways and byways of the northeast, their origins and motivation to remain forever unknown. Delve into the magnificent homes of William Gillette and Madame Sherri, famed socialites who constructed enormous castles in the New England countryside. Learn of William Sheldon’s apocalyptic prophecies and wild claims including that the American Revolution had hastened the end of the world and that he could, through his mastery of the “od-force” prevent cholera across the eastern United States. And find out about the mysterious fortune-teller Moll Pitcher whose predictions, some say, were sought by European royalty and whose fame made her the subject of poems, plays, and novels long after her death. Stretching back to the colonial era and covering the development and evolution of New England society through the beginning of the 21st century, this book captures the rebel spirit, prickly demeanors, and wily attitudes that have made the region the hotbed for oddity it is today. This event is free and the program begins at 5:30 p.m. The Connecticut River Museum is located at 67 Main Street on the Essex waterfront and is open daily from 10 a.m. to 5 p.m. The Museum, located in the historic Steamboat Dock building, offers exhibits and programs about the history and environment of the Connecticut River. For a full listing of Museum programs, visit www.ctrivermuseum.org or call 860-767-8269.